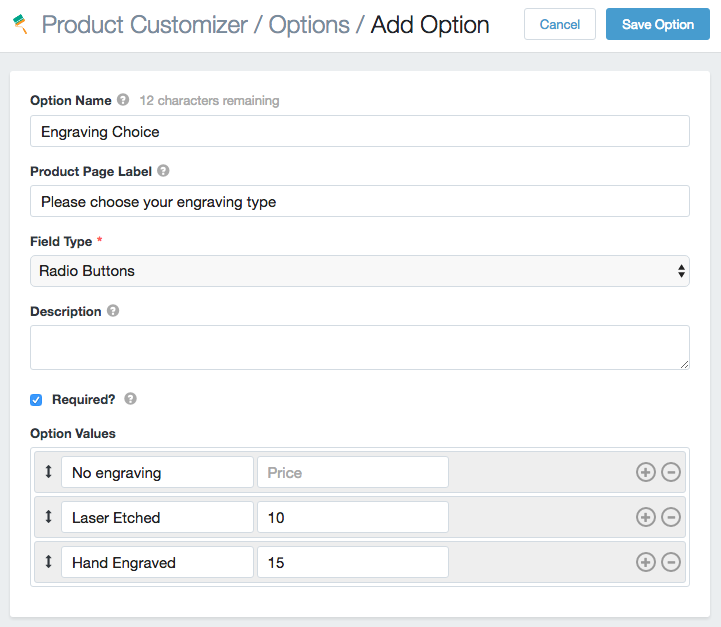 Product Customizer's premium tier allows you to add costs to an option created with the app, which is not available in the regular tier. Any price or cost added by the app will be added to the product price when purchased by the customer. 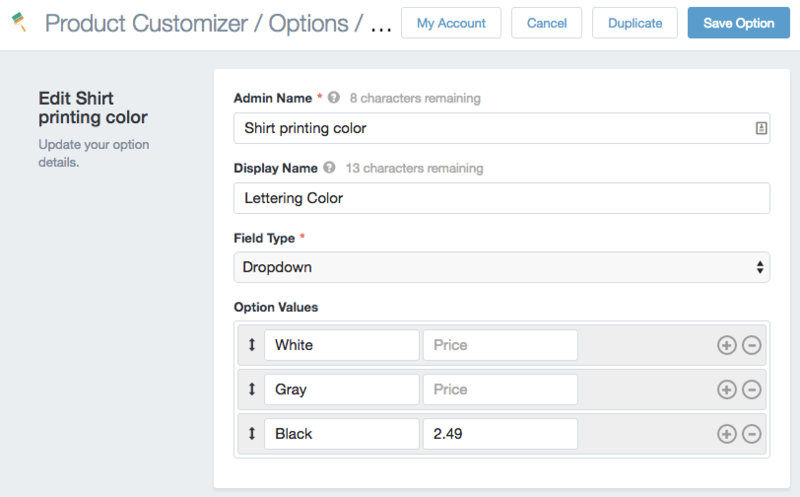 Important: In order to change pricing, Product Customizer will create a hidden "Item Customizations" product in your store. This product must remain in your Products list, as its price is used to add costs to your options. Customers will not see this product in your store. Example: Customer purchases a $100 product, and selects an option with a price of $5. The customer will be charged $105 for the item. If the customer increases the item quantity, this cost will be used. Continuing with our example, ordering 2 of the item would cost $210 (not $200), ordering 3 would cost $315, and so on. Additional costs can be added based on choice for some fields, or based on completion for other fields. Any options that have values or choices can allow pricing based on the customer choice. If a price is not specified for a choice (blank), the choice is free, and choosing it will not result in any additional costs added to the product. To add a cost to a dropdown option, enter a price next to the option text. When this item is chosen, the cost will be added to the product price. You can mix prices of your option values; prices are entirely optional for each value, so some can be free and some can be paid, all can be free, or all can be paid. To add a cost to a radio button option, enter a price next to the option text. When this item is selected, the cost will be added to the product price. The radio button fees work the same way as dropdown fees. To add a cost to a checkbox option, enter a price next to the option text. When this item is checked, the cost will be added to the product price. 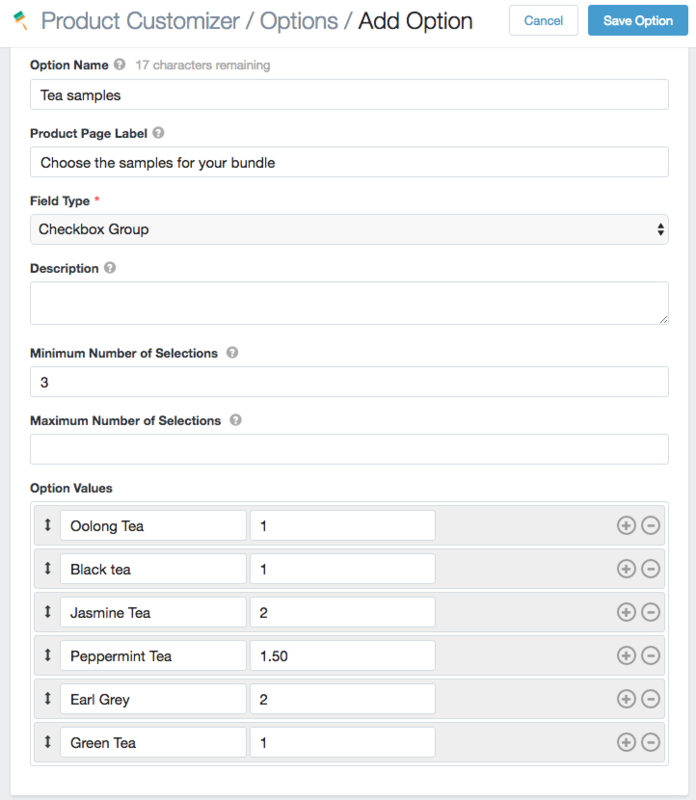 Since multiple checkboxes can be checked at a time, multiple costs will be added. For example, if there are 3 checkboxes in a group, and each costs $10, then checking 2 checkboxes will result in a $20 additional charge. Each checkbox fee is added separately to the product price. 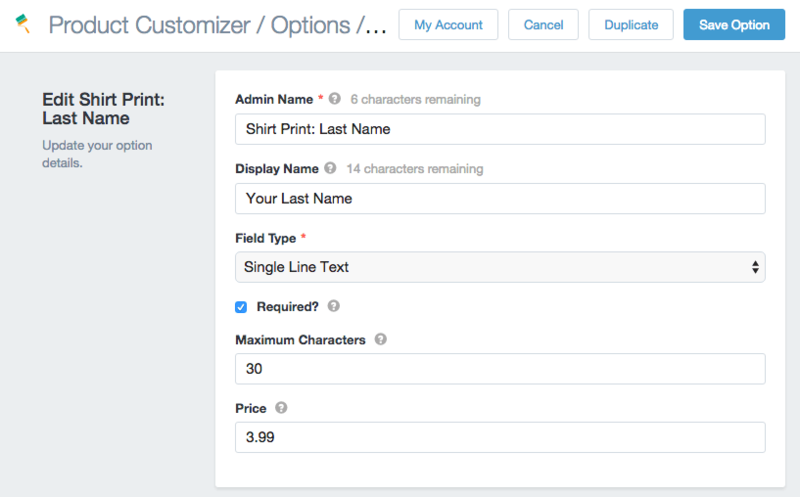 The single-line text input, paragraph text input, single checkbox, and file upload field types do not use "option values", and thus the price will depend on the field itself rather than a choice selected. If a price is specified for one of these fields, it will be charged if the field is completed. For example, if a text input has a price associated with it, then leaving this field blank will not result in a fee. However, entering text in this field will result in the fee being added to the product price. If a file upload has a price attached, then this fee will be added if a file is uploaded to the field. 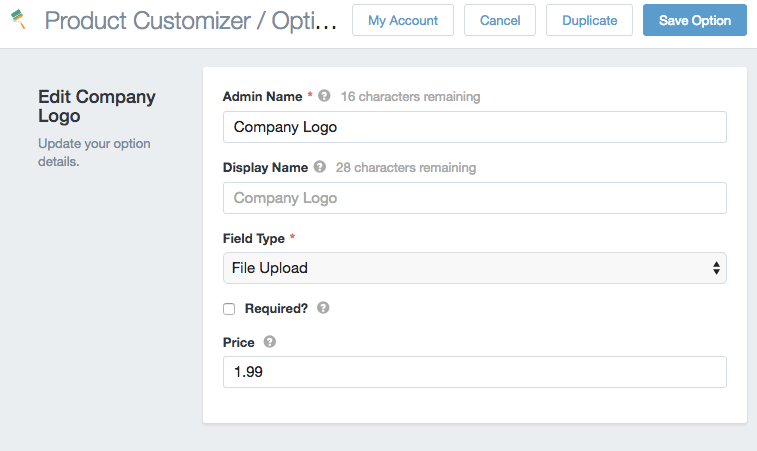 To cancel a file upload and remove a price, the "upload file" button must be clicked again, then the customer can hit "cancel" to remove the file.